Athlete Morgan Turner attempts a putt for a foursome at the 2018 SOKY Golf Classic. 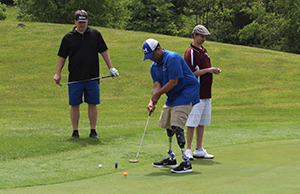 Join Special Olympics Kentucky and our friends from Walmart on Friday, May 18, for the Seventh Annual SOKY Golf Classic at Gibson Bay in Richmond. The SOKY Golf Classic is four-person scramble that helps support the State Summer Games, which will be held at Eastern Kentucky University June 1-3. The morning gets underway at 8 am with registration. Each golfer receives greens fees and cart, one mulligan, 10 vendor door prize raffle tickets, one “Putt with a Pro” opportunity (where a Special Olympics athlete takes the first putt for your team on a designated hole), and a “19th Hole Challenge” opportunity. The 19th hole is a new addition that gives you a chance to tee off on a hole on the Gibson Bay par 3 course to win a prize. The shotgun start takes off at 9 am. There are prizes for first through fourth place as well as last place and closest to the pin, long drive and hole in one prizes. Breakfast and lunch are both provided courtesy of Bimbo Bakeries..
Foursomes are $500 each and include 18 holes and carts, the two golf ball drop balls for each golfer, and a marshmallow drive chance, mulligan, putt like a pro opportunity and a vendor prize raffle ticket for each golfer, making it one of the best values in the area. For more information about the 2018 SOKY Golf Classic or to inquire about sponsorship opportunities, contact Trish Mazzoni, Special Olympics Kentucky President/CEO, at 800-633-7403 or tmazzoni@soky.org; or Tony Bryant of Walmart at 502-867-0547.